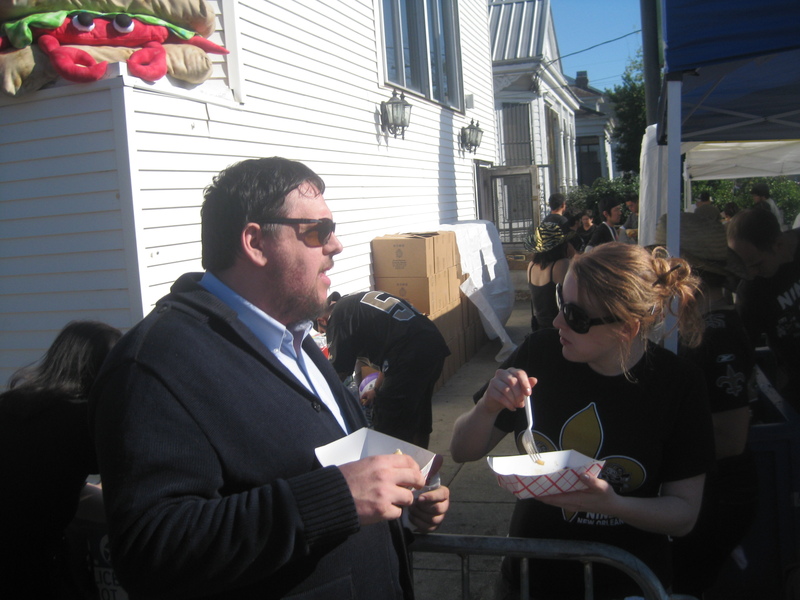 So I hit the New Orleans Oak Street Po-Boy Fest yesterday for the first time in two years. The last time I went it was crowded, and actually quite difficult to get a po-boy of any non-red meat variety. 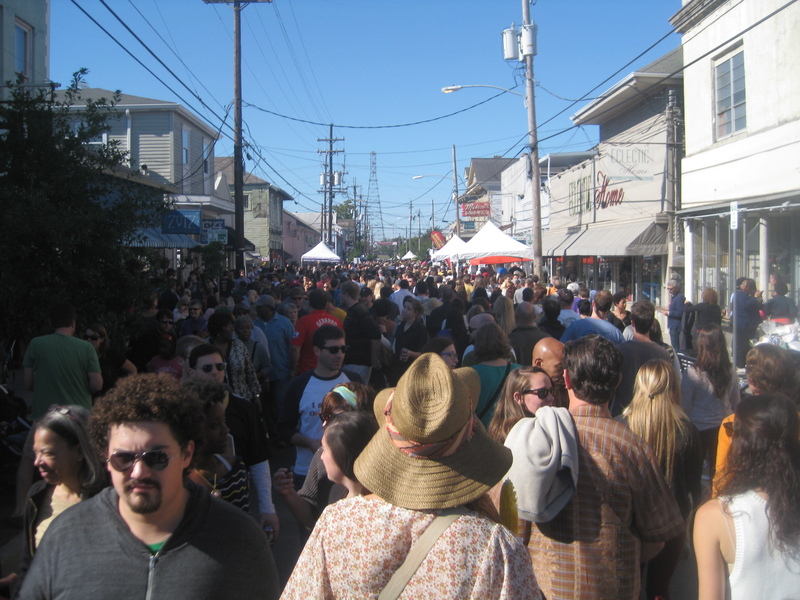 The vendors had apparently not anticipated the incredible turn out (and why NOT one can’t help but ask, for putting po-boys and festival in the same sentence in NOLA OUGHT to equal stock the shelves), the bands were too spaced out, and the booze a bit difficult to find. But the idea of a festival dedicated entirely to things like Jacquesimo’s shrimp and alligator sausage cheesecake, and po-boys of any kind you might be able imagine, is an idea that has me willing to brave the utter lack of parking. I mean, if you hike for the calories you can just eat more calories right? Plus, this year, they promised over 30 vendors would be selling their wares on Oak St, and that they would expand the crowded festival to the two streets bordering it, in the hopes spreading around the crowd. So I got there shortly after the festival started. I paid $8 for a bloody mary, but since it was a damn good and strong Bloody Mary it was worth every penny. I fought the ever-increasing crowds to find familiar faces, and then we commenced waiting in line. For an hour we waited in line for the infamous waffle and fried chicken po-boy. This, if you’re not familiar with the concept, is a sandwich made entirely of waffles, sweet potato in this case, and fried chicken. Not eating meat of the chicken variety I passed, but all hands proclaimed it delicious. Worth an hour in line though? Perhaps not. The Festival announced today that over 50,000 people attended the fest yesterday, and when you picture that anount of people crowding onto three streets all in search of heart attack inducing caloric goodies – well, you get the cramped picture I think. I myself sampled a lobster po-boy. It is, perhaps, at this time should describe the delicacy that is a po-boy for those of you who are unfamiliar with it. A po-boy is a sub-style sandwich served on specially crafted French Bread – the bread is baked without the heel at either end so that it can literally be smothered with whatever toppings you choose. My all time favorite po-boy will always be the fried green tomato and shrimp remoulade po-boy from Crabby Jack’s, who, I might add, were purveying their fine sandwich along Oak St as well. But po-boys come in the roast beef and gravy variety, the shrimp and oyster variety, and, a personal fascination I have yet to try, the French fry and gravy variety. That’s right folks – it’s a sandwich stuffed with French fries and covered in gravy. Diabetics, and anyone concerned about a fully functioning pancreas beware! But the gist of the po-boy story is, anything goes, and as much as can fit on the sandwich and more goes on it. Enter my disappointment with the Lobster po-Boy served yesterday by Chiba. Granted, the po-boys here are about 4 inches to the normal 6, 9, or 12 inch varieties you see at shops around town (the better to sample more of them). However, this po-boy had only three pieces of lobster tempura on the whole sandwich. It reminded me more of a po-boy you get somewhere outside of New Orleans where the people don’t understand that the sandwich is supposed to be literally overflowing with the goods. While the lobster was tender and tasty, the sandwich itself was a disappointment, particularly at the $14 price point. Had they actually stuffed that baby up like a po-boy in all its slender should be stuffed (and dressed properly with lettuce, tomato, and some sort of mayo and hot sauce I might add) it would have knocked my socks off. As it was, the $3 shrimp steamed bun Chiba was also serving blew the lobster po-boy out of the water in terms of tasty deliciousness. I would rather have had three of those than one of the lobster po-boys. And that, my friends, should not be the case. In terms of the layout, the festival was even more crowded than I remember, and while the booze was easier to come by the bands were so spread out that we couldn’t hear any music in the hour long line for chicken and waffle po-boys. And believe me, give a NOLA girl a drink, which we had, and some groovy tunes, which we did not, and we could have shimmied our way towards those chicken and waffle po-boys without even noticing (too much) how long we were waiting. As far as the other goods and sundries, I tried the crawfish mac and cheese. While this was probably one of the tastiest things I had yesterday, I found it rather lacking in both cheese and crawfish, and would much rather hit up Twelve Mile Limit for cheesy pasta goodness. Which, in the end, was pretty much my take on the day. Frankly, a po-boy festival in November is well positioned to sate that hungry for Crawfish Monica NOLA fest food that we’re all craving between Fests. But perhaps because of the tight location, and perhaps because the vendors are still under estimating the turn out, the event falls short. 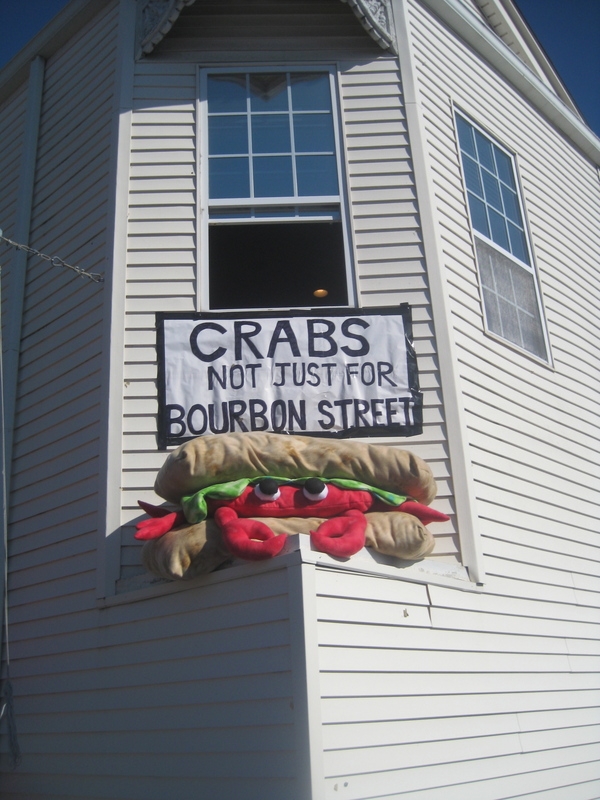 Frankly I’d rather just go to Crabby Jack’s or Parkway and have a full po-boy of well-known awesomeness. In New Orleans, we have so many awesome food options ALWAYS that its hard to waste any meal or money on mediocre. But still, it’s a festival. Dedicated to po-boys. And po-boys are delicious! So I’ll keep going back. Because even a not so great po-boy, is still a po-boy. I’ll just hope that they continue to work on spreading the festival out so that its less crowded with people, and more crowded with yummy little fried things on French bread. um, excuse me, Twelve Mile Limit for your cheesy pasta goodness? Ahem, *coughs*.